[TMON331] Roger de Montgomery received grants including the city of Chichester and the castle of Arundel, and therefore may be considered to have become the 1st Earl of Arundel (1067), and he frequently styled himself Earl of Chichester. On the dismemberment of Mercia (1070), he acquired nearly the whole of Shropshire, together with the castles of Montgomery and Shrewsbury, and the Lordship of the West Marches. Afterwards he was generally known as Earl of Shrewsbury, or occasionally Earl of Shropshire. He died July 1094. [TMON341] Robert de Belleme became 3rd Earl of Shrewsbury and 3rd Earl of Arundel (1098), succeeding his younger brother Hugh who was the 2nd Earl. . . [CAYH431] Baron Nigel d'Aubigny of Caynho m. ? [ARUN331] William d'Aubigny (born c.1015, at Saint-Martin d'Aubigny, Manche, son of [SAUV391] Neil III de Saint-Sauveur, see SAINT-SAUVEUR), Seigneur d'Aubigny, in Coutances dept. of La Manche, married --- (sister of Grimaud du Plessis). [CAYN431] Nigel d'Albini (son of William), is described under CAYNHO. [ARUN341] Roger (born c.1048, at Saint-Martin d'Aubigny, son of William) married [MOWB342] Avita/Amicia (daughter of [MOWB331] Roger de Mowbray, Seigneur de Montbrai). [ARUN351] William (born c.1070), also referred to as William pincerna regis (chief butler to King William I), married [NORF433] Maud (daughter of Roger, see NORFOLK (BIGOD) EARLDOM). 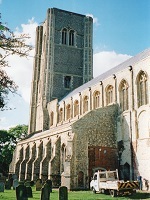 William died (1139), and was buried at Wymondham Priory which he had founded in 1107. [ARUN361] William strong hand, feudal Lord of Buckenham, Norfolk, married (1138) [LOUV362] Adeliz (Dowager Queen of England, daughter of DUKE GODFREY I, see LOUVAIN, and widow of [NORK349] King Henry I). William obtained the Castle and Honour of Arundel, by his marriage with the Dowager Queen. He therefore became 4th Earl of Arundel (1139). At or about this time was also created 1st Earl of Lincoln (c.1139), though this was exchanged for the Sussex Earldom (1141). Thence he was styled indifferently Earl of Sussex, Earl of Chichester and Earl of Arundel. Adeliz retired to a nunnery at Afflighem, South Brabant, (1150), where she died (23rd April 1151). 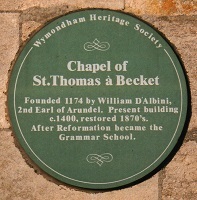 William founded Becket's Chapel at Wymondham (1174). 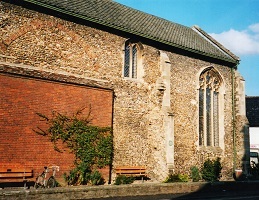 Present building dates from c.1400. William died at Waverley Abbey, Surrey, (12th October 1176), and was buried at Wymondham Priory. [ARUN373] Alice (daughter of William) married [EUEU371] Count John (see HASTINGS (EU) FEUDAL LORDSHIP). [ARUN371] William (son of William) married [HILA379] Maud (see SAINT-HILAIRE DU HARCOUET). Maud had previously married [HERT451] Earl Roger (see HERTFORD (CLARE) EARLDOM). William became both 5th Earl of Arundel and 2nd Earl of Sussex (1189). He died 24th December 1193, and was buried at Wymondham Priory. [ARUN381] William (son of William) married [BAYE382] Mabel (2nd daughter of Earl Hugh, see CHESTER (BAYEUX) EARLDOM). William became both 6th Earl of Arundel and 3rd Earl of Sussex (1193). He went on a Crusade, and was at the taking of Damietta (November 1219). He died at Cainell near Rome (c. March 1221), and was buried at Wymondham Priory. [ARUN393] Nichole (born c.1210, a daughter of William) married [SOME481] Roger (see SOMERY). [ARUN392] Isabel (2nd daughter of William) married [ARU2461] Lord John (see ARUNDEL (FITZALAN) EARLDOM below). [ARUN394] Colette d'Albany (daughter of William) married [SUTT291] Amandus Sutton (born c.1186, see SUTTON). [DINA321] Count Haimon I of Dinan m. ?
. [ARU2401] Dapifer Flaad of Dol m. ? . . [ARU2411] Dapifer Alan of Dol m. ?
. . . [ARU2421] Dapifer Fleald of Dol m. ? [ARU2401] Flaad (born c.1000, son of [DINA321] Haimon, see DINAN), Hereditary Seneshal of Dol, Dapifer of Dol. [ARU2421] Fleald/Flathald (born 1016) (brother of [not son of] Sir Alan, the Crusader Knight] and therefore son of Alain the Dapifer). See "Studies in Peerage and Family History" (J.H. Round, 1901) pp. 115-129). He died 1080. [ARU2431] Alan FitzFleald, (born 1078) Feudal Baron of Oswaldstre (Oswestry), Sheriff of Shropshire (1101), founded Sporle Abbey, received Oswestry Castle from Madog ap Maredudd (see POWYS KINGDOM (2)). He died 1114. Alan married 1. [HESD343] Aveline (daughter & heir of Seigneur Arnould/Arnulf/Ernulf of Hesdin, Picardy, see HESDIN). He died c.1110-14, and afterwards Aveline married 2. [CAEN441] Robert FitzWalter of Caen (see CAYNETO)..
[STEW461] Walter FitzAlan (3rd son of [ARU2431] Alan) is described under HIGH STEWARDS OF SCOTLAND. [ARU2441] William FitzAlan (eldest son of Alan), Marcher Lord of Oswestry (see MARCHES), married 1. Christiana (niece or kinswoman of Earl Robert Fitzroy of Gloucester; then 2. [SAY3372] Isabel (sole daughter & heiress of [SAY3361] Helias de Saye, see SAYE OF CLUN). Isabel was Lady of Clun, and afterwards William therefore became Marcher Lord of Clun and Oswestry. 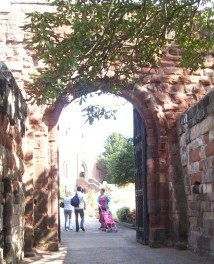 He became Constable of Shrewsbury Castle (1126). William founded Haughmond Abbey (1135). 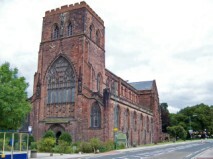 William died c.1160, and was buried at Shrewsbury Abbey. Afterwards Isabel married 2. (before 1166) Geoffrey de Vere, died 1170; then 3. (before 1188) William de Boterel/Botreaux. Isabel died 1199, and was survived by her third husband. [ARU2451] William (son of William & Isabel, a minor when his father died, became of age 1175) was Marcher Lord of Clun and Oswestry. He married [LACY473] --- (daughter of [LACY461] Hugh de Lacy, Lord of Meath, and sister of Walter de Lacy, see LACY (2)). He died 1210. [ARU2461] John (2nd son of William) was Marcher Lord of Clun and Oswestry (succeeding his elder brother William who died without issue, 1216). He married 1. (c.1222) [ARUN392] Isabel (see ARUNDEL (AUBIGNY) EARLDOM above). After Isabel died, he then married 2. Hawise de Blancminster. He died 1240. [ARU2472] Margery FitzAlan (born c.1254 [which is 14 years after her father died], daughter of John & Isabel), married [CORZ493] Sir Walter Cornwall (see CORNWALL (FITZROY) EARLDOM). [ARU473] Isabel (born 1214, daughter of Sir John FitzAlan & Isabella) married [GREN461] Sir Walter de Grene de Boketon (born 1206, son of Alexander & Isabella Devereux, see HENRY-GREENE). Isabella died 1232 and Walter died c.1262. The dates appear to have errors. [ARU2471] John (born May 1223, son & heir of John & Isabel) was Marcher Lord of Clun & Oswestry, then became 9th Earl of Arundel (1243, though he appears never to have used this title). He married [BOTI492] Maud (daughter & heir of Theobald II, see VERDUN). He took part in the Welsh war (1258), and fought on the Royalist side at the Battle of Lewes (14th May 1264) where together with King Henry III he was taken prisoner. John died October-November 1267, and Maud afterwards married 2. Richard d'Amundesville. Maud died 27th November 1283. [ARU2481] John (born September 1246, only son & heir) married [MORT483] Isabel (daughter of Sir Roger, see WIGMORE (MORTIMER) BARONY). He became 10th Earl of Arundel (1267, though he appears never to have used this title). He died 18th March 1271-72, and was buried at Haughmond Abbey, Salop. Afterwards Isabel married 2. (before 1273) Ralph d'Arderne; then 3. (at Poling, Sussex, September 1285) Robert de Hastang (see HASTANG). Isabel died shortly before April 1292, and was also buried at Haughmond Abbey. [ARU2491] Richard (born February 1267, only son & heir), Marcher Lord of Clun and Oswestry, became 11th Earl of Arundel (1272). He married (before 1285) [SALU422] Alasia (daughter of March Count Tommaso I, see SALUZZO (PIEDMONT)). He fought in the Welsh Wars (1288), was Knighted (1289), fought in Gascony (1295-97), fought in the Scottish Wars (1298-1300), and was at the Siege of Caerlaverock (July 1300). Alasia died 25th September 1292, and was buried at Todingham Priory (later transferred to Haughmond Abbey). 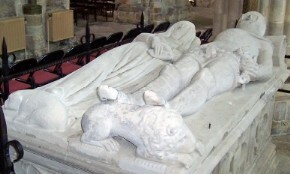 Richard died 9th March 1301-02, and was buried at Haughmond Abbey. [ARU2501] Edmund (born at Marlborough Castle, Wiltshire, 1st May 1285, son & heir) became 12th Earl of Arundel (1302), and married (1305) [SUR2502] Alice (daughter of William, see SURREY (WARENNE) EARLDOM). He was knighted (May 1306). Having been captured at Hereford by the Queen's party, he was beheaded without trial at Hereford (17th November) 1326, and his title forfeited. He was buried at the Franciscan Church, Hereford, but later reburied at Haughmond Abbey. Alice died sometime between 1330-38. [ARU2511] Richard copped hat (born c.1313, though a modern plaque at Chichester Cathedral shows 1307, son & heir of Edmund) became 14th Earl of Arundel (1331). He married 1. Isabel de Despenser (divorced 1345); then 2. (at Dalton, 1345, though he had cohabited with her for some time) [LANC512] Eleanor (daughter of Earl Henry, see LANCASTER (PLANTAGENET) EARLDOM). Richard became Justiciar of North Wales for life (1334), was Governor of Caernarfon Castle (1339), took part in the wars with France, was Admiral of the West (1340-41 & 1345-47), became Sheriff of Shropshire for life (1345), commanded the 2nd division at the Battle of Crecy (26th August 1346), the toll of which Battle included eleven princes, eighty bannerets, 1,200 knights, and about 30,000 common men. Richard was also present at the Fall of Calais (4th August 1347), which Siege had begun on 9th September 1346. He became 9th Earl of Surrey (1347), following the death of his uncle, the 8th Earl, though he did not assume the title until after the death of the Dowager Countess (August 1361). Eleanor died at Arundel (January 1372), followed by Richard (January 1376), and they were both buried at Lewes Chapter House. After the dissolution of the monasteries, their tomb was removed to Chichester Cathedral. 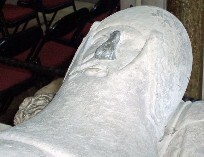 [ARUJ521] Sir John de Arundel (born c.1345, younger son of Richard the 14th Earl & Eleanor). John was both created 1st Lord Arundel and became Marshal of England (1377). He married [MAUT522] Eleanor (born 1345, 2nd daughter of John Mautravers, see MAUTRAVERS BARONY). Being in command of a naval expedition in aid of John, 11th DUKE OF BRITTANY, he defeated the French fleet off the coast of Cornwall, but was later wrecked and drowned in the Irish Sea (15/16th December 1379). Eleanor died 10th January 1404-05. [ARUJ532] Margaret (daughter of John & Eleanor) married [ROOS531] Sir William (see HELMSLEY (ROS) BARONY). [ARUJ533] Joan (daughter of John & Eleanor) married [ECHI531] Sir William (see ECHINGHAM BARONY). [ARU2521] Richard de Arundel (born 1346, elder son of Richard 14th Earl & Eleanor, apparently whilst he was cohabiting with her, and was therefore illegitimate) married 1. (1359) [HERE522] Elizabeth (daughter of Earl William, see HEREFORD (BOHUN) EARLDOM), died April 1385; then 2. (August 1390) Philippe (daughter of Edmund, Earl of March, and widow of John Hastings). Richard was 15th Earl of Arundel (1376), 10th Earl of Surrey (1376), Admiral of the West & South (1377), Lord Treasurer (1379-80, Admiral of All England (1386), invested Knight of the Garter (1386). He distinguished himself in the French Wars, gaining a brilliant naval victory over the allied French, Spanish and Fleming fleets, off Margate (24th March 1387). He became Governor of Brest (1388), took part against the King Richard II (1388), but was pardoned (1394). Afterwards he was tried for treason at Westminster (12th July 1397), and beheaded at Cheapside (21st September), it is said by his son-in-law Sir Thomas Mowbray, the Earl Marshal, after first binding his eyes. (A year later this Thomas was banished from England for life, see NORFOLK DUKEDOM.) Richard was buried at Church of Augustine Friars, Bread Street, London. Afterwards Philippe married 3. Thomas Poynings, Lord St. John of Basing, and died September 1401. [ARU2532] Elizabeth de Arundel ([born c.1360], eldest daughter of Richard & Elizabeth) married 1. (before December 1378) William Montagu; then 2. (July 1384) Thomas Mowbray (see NOTTINGHAM (MOWBRAY) EARLDOM), and was appointed Lady of the Garter (1386); then married 3. (before August 1401) [GOWS532] Sir Robert (see GOWSELL); then 4. (before July 1414) Sir Gerard Usflete.